Vietnamese Weddings in the U.S. are a magnificent culmination of historic and contemporary traditions. Everything from the Vietnamese Wedding Dress, the Ao Dai, to the extensive Vietnamese Tea Ceremony is a great representation of beauty and richness within Vietnamese culture. 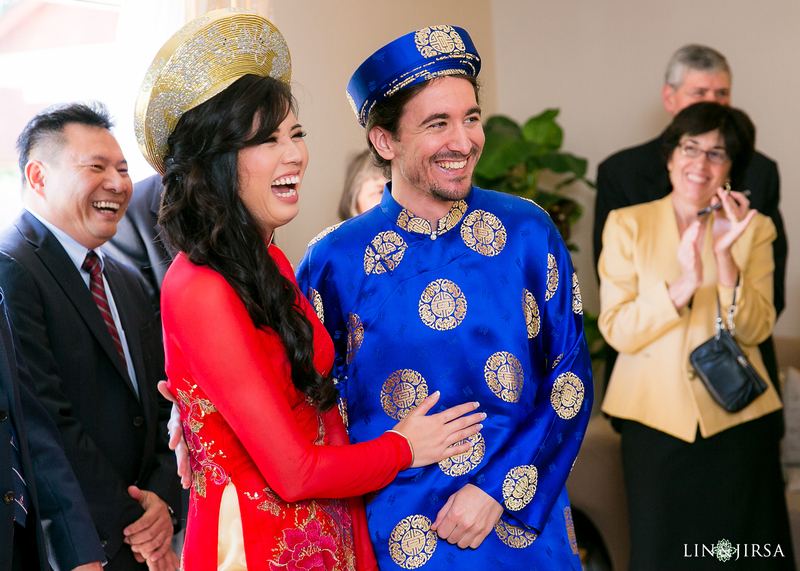 Vietnamese weddings are some of our most common weddings here at Lin & Jirsa. To see these charming Vietnamese weddings, be sure to check out our blog! Traditionally, the groom’s parents will lead a procession to the bride’s family home where the groom and his family will ask for the bride’s hand in marriage. Gifts are carried by family members in even numbers and stored in a Mâm Qua, or red tin baskets, and covered with a traditional red cloth. After receiving approval, the groom and his family are invited inside to exchange gifts and proceed with the wedding ceremony. After a few formal introductions, the groom will present his gifts to the bride’s family before receiving permission to see his bride-to-be. The bride will be escorted, often by her mother, where she will meet her groom who will be ready to greet her with a bouquet in hand. The two will then make their way to the Vietnamese alter to begin the Tea and Candle Ceremony. The Tea Ceremony combines the celebration of marriage with honoring the family’s ancestors and relatives. This makes it one of the most compelling and emotional parts of a Vietnamese wedding. It is considered the proper meeting of both families, and it is also when the bride and groom take their vows and exchange their rings. Once the exchange has occurred, both the bride and groom will serve Green Tea or Chrysanthemum Tea as a sign of respect, starting with the eldest family members. Thereafter, family members will gift the bride and groom with money, family jewelry, and advice for a long-lasting marriage. The ceremony concludes with the lighting of a big dragon and phoenix candle, symbolizing the fusion of two families. 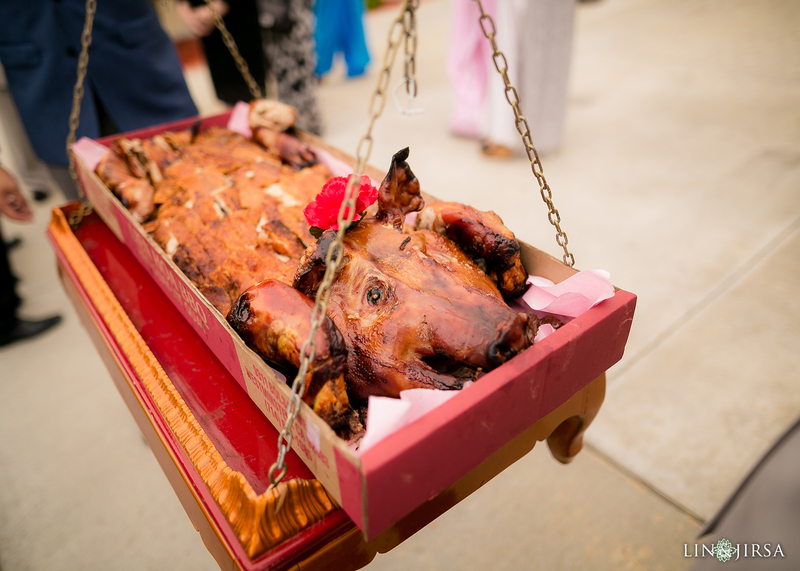 It is traditional in Vietnamese weddings for the groom to gift a roasted pig to the bride’s family. One of the most iconic symbols of the Vietnamese Wedding is the Vietnamese Wedding Dress or the Ao Dai. The Ao Dai is worn by both the bride and groom during the Vietnamese Wedding Ceremony and/or during the reception as the couple makes their rounds to greet and thank their guests. The Ao Dai has a fitted top with floor length panels and a pair of accompanying pants. With Ao Dai, the bride and groom will often wear a circular headdress called a Khan Dong. 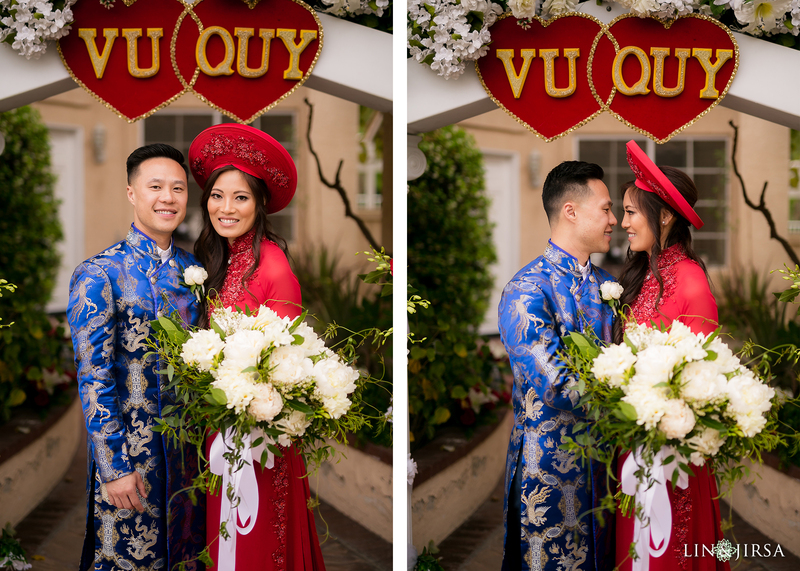 Vietnamese-American couples often hold another ceremony after the Vietnamese tea ceremony where the bride gets her chance to wear that elegant white dress and the groom wears a traditional tuxedo. The type of wedding will depend on the religion of the couple, with a majority of the ceremonies being performed in Catholic churches and sometimes other venues. 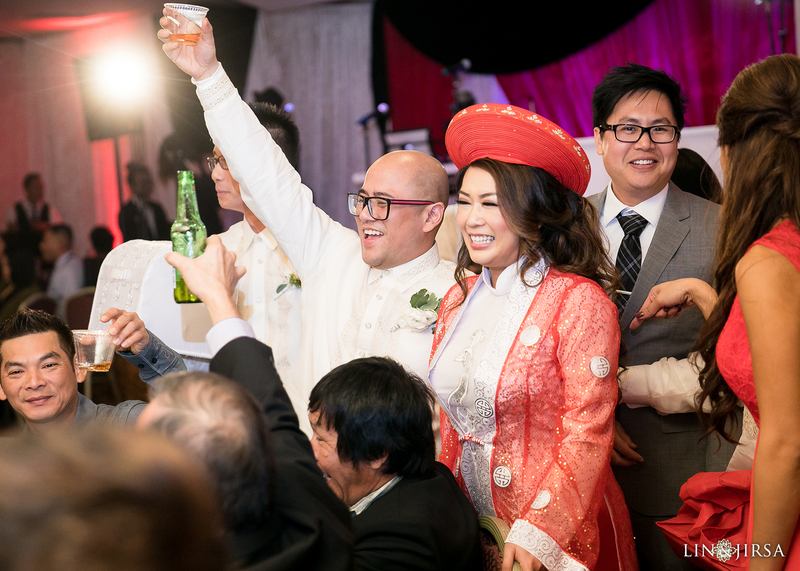 The Vietnamese wedding receptions often follow the same format as a typical American reception, with a grand entrance, first dance, parent dances, cake cutting, toasts, games, desserts, dancing, and more. In addition, welcome photos are popular amongst Vietnamese wedding receptions. The bride and groom will be situated at the reception entrance to take a photo with each of their guests. The photos are printed prior to their guest’s departure as a thank you for their love and support on this big day. Another tradition that happens at most Vietnamese wedding receptions is the table visits. As a thank you and sign of respect, the bride and groom will make their way to each table and greet their wedding guests. The most significant family and friends will be visited first and a toast will be given acknowledging the most important person of each table. It is traditional for guests to give the bride and groom envelopes filled with money at this time. Once the bride and groom have made their rounds, the party officially begins! In more recent years, Vietnamese brides have chosen to wear white versions of the Ao Dai as a way to pay tribute to both the traditional Western Wedding Dress and the Ao Dai. Above is a Vietnamese bride and her Filipino husband wearing the traditional Filipino shirt, the Barong. Interested in learning about other East Asian Wedding Traditions? Check out: Korean and Chinese Wedding Traditions.